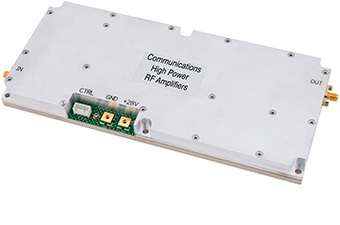 Corry Micronics, Inc. (CMI) offers a wide range of cellular band high-power amplifiers operating over the 900 MHz to 2,700 MHz frequency range for use in a variety of cellular applications. This family of amplifiers features high linearity, base station quality, low noise figure, and frequency modulation in GSM, LTE, and UMTS. The cellular band amplifiers are Class A/B using LDMOS technology and Doherty amplifier architectures. Operating voltages are at 28 VDC. These amplifiers have the option to be hermetically sealed if required, and can be made available with optional heat sinks. Built in amplifier safeguards include Automatic Level Control (ALC), temperature monitoring, current monitoring, power monitoring, mute control, short circuit (VSWR) protection, and gain control. The table above offers links to the available datasheets. Click here for the full list of downloads.